This Radio Service Data Sheet for the Clarion "Replacement" Chassis, Model AC-160 A.V.C. Superhet is an example of the dozens of similar schematic and alignment instruction sheets that have been posted on RF Cafe over the years. Obtaining technical information on most things, even readily available items, prior to the Internet era was often very difficult - if not impossible. Service centers had what was need provided by manufacturers and distributors, but if you wanted to find a part number or service data on a refrigerator, radio, lawn mower, garage door opener, etc., and did not have the original paperwork, you were usually out of luck. Nowadays a Web search will quite often get you what you need thanks to people (like me) who go to the trouble of making the information available. The stuff doesn't just magically appear or get posted by benevolent governmental entities. You're welcome. 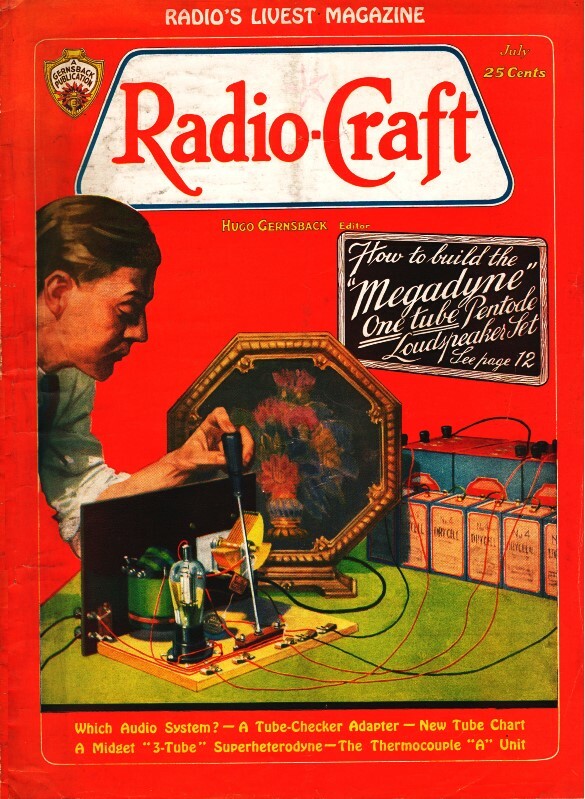 Of the estimated 17 million radio sets now in use in the United States, the chasses of approximately 11 million are now obsolete, due to the rapid advance in receiver design. At the same time, the cabinets in which these chasses are housed are just as much in vogue as the day they were bought, and they still represent a considerable portion of the cost of the ensemble. To offset this discrepancy, a western manufacturer has brought out a 10-tube super-heterodyne receiver chassis, complete in every respect, and modern in design, which is to be used as "replacement" for the older set models. The diagram of this receiver, the model AC-160, is shown. The chassis is available without tubes. The electrical values of the components are as follows: Resistor R1, volume control, 1,150 ohms; R2, tone control. 0.1-meg. ; R3, 8,000 ohms; R4, 0.1-meg. ; R5, 2,000 ohms; R6, 400 ohms; R7, 0.5-meg. ; R8, 40,000 ohms: R9, R12, 10,000 ohms; R10, 30,000 ohms; R11, 0.2-meg. ; R13, 300 ohms; R14, 700 ohms: R15, 175 ohms; R16, 2.900 ohms; R17, 4,300 ohms; R18, 3,800 ohms; R19, R20. 1,000 ohms. Condensers, C1 , C2, C3, are tuning units; C4, C18, 0.0008-mf. ; C5, C7, 0.02-mf. ; C6, C12, C14, C21, C25, 0.1-mf. ; C8 0.7-mf. ; C9, C10, C22, 0.05-mf. ; C11, 0.00005-mf. ; C13, 0.01-mf. ; C16, C23, 8 mf. ; C19, C20, 0.35-mf. ; C24, 1.0 mf. Operating-voltage and current characteristics are taken with the volume control set "full on," and the "supersensitive" switch turned "to right." Do not connect the ground wire to the "Ant." post unless a fixed condenser is connected in series, to prevent a burnout of the antenna coil in the event that a ground may have occurred in the power transformer. A good ground is important to satisfactory operation: selectivity and circuit stability depend upon this consideration. The ground connection is conveniently tested by grounding one side of a 110-volt lamp, noting the brilliancy when each side of the light-line is connected to the remaining lead of the lamp: a dim light indicates a poor radio ground. An entire absence of light in this test usually indicates a lack of ground at the main power transformer; in this case the local power company should be notified. Switch SW.2 should not be thrown to the "Phono" position unless a pickup is in the circuit; otherwise, noise and fluttering will result. Poor sensitivity may be due to mis-alignment of the tuning condensers, but the trimmer's of these units should not be adjusted except as a last resort. Since this receiver has automatic volume control, poor tone quality will result if the set is adjusted slightly off-tune. Therefore, it is recommended that the volume first be reduced to low audibility, the set tuned for a point mid-way between the two extreme dial points of reception, and then the volume brought up to normal. Another method of checking tone quality at this point is to substitute for the regular antenna, a very short piece of wire, so that the volume control must be adjusted to the "full on" position, when the A.V.C. feature no longer holds, tuning being "peaked," as in the ordinary types of sets. A poor tvpe '27 tube used as the second-detector V5, or A.V.C. V9, will result in poor operation. Note that tubes unsuited to use in these positions may test "okay" on a tube checker. In "noisy" localities it may be well to shunt the power line by a filter system of the usual type - two 0.1-mf. fixed condensers, connected in series, the two free ends connecting to the two line-leads, and the center-tap being grounded. Due to tile high audio gain of this receiver, special precautions in the design were taken to eliminate hum beyond the normal, slight degree existing in practically all sets. Consequently, should a complaint of hum arise. after eliminating the usual possible causes check the position of A.F. transformer T1. The angle of its mounting bracket has been carefully calculated to eliminate hum and if for any reason T1 must be replaced, be sure to retain the bracket and see that it is not accidentally twisted out of its original angle. The tuning condenser nearest the front-panel is C1, followed by C2, and C3, (in this order); the trimmer for each of these circuits is located on top of the respective tuning unit. Padding condenser C4A is located on the front skirt of the chassis, alongside unit R1-SW.2. Trimmers of the I.F. circuits are located on the left-hand side of the respective I.F. transformers, the top adjusting screw of the two being the grid-circuit tuning control; I.F. transformer I.F.T. 1 is the one nearest the front-panel. Connect the 175 kc. service oscillator to the control-grid cap of V2, and to ground. Do not remove any of the tubes from the sockets; also, it is unnecessary to disconnect the control-grid cap connection from V2. After adjusting the I.F. circuit, connect a broadcast-frequency service oscillator to the input posts of the radio set, and tune in its signal at 1400 kc. Now adjust the trimmers of C1 and C2, respectively, for maximum output. To check the calibration of the receiver, whether it is high or low, the trimmer in shunt to C3 should be adjusted until a crystal-con trolled station of known high frequency is brought in, at the correct dial marking, with peaked tuning and maximum volume. If the broadcast-frequency service oscillator is accurately calibrated, it might be used in place of the broadcast station's signal which, however, is held within about 50 cycles by reason of the crystal-control. In this adjustment a test frequency of 1400 kc. should be used. Note that at this frequency the setting of the trimmer of C3 will be exceedingly critical. Now comes the problem of balancing the oscillator to the R.F. and detector circuits so that perfect tracking will be obtained over the entire tuning range. Tune the external broadcast-frequency test oscillator and the receiver both to 600 kc., then slowly increase or decrease the capacity of C4A, at the same time continuously tuning back and forth across the signal with the receiver tuning condenser gang. The output meter needle will now be swinging up and down in step with the variation in tuning. Watch the peak of this swinging closely and readjust C4A until the swinging needle reaches its highest peak. Retune the receiver and broadcast-frequency service oscillator to 1400 kc. and re-check the trimmer of C3 to make sure that the adjustment of C4A has not thrown the receiver out of calibration. Should this have occurred, readjust the trimmer of C3 until the calibration is correct, and then check on the trimmers of C2 and C1 to make sure that the adjustment of C4A has not reduced the sensitivity. Schematic circuit, Clarion "Replacement" Chassis, Model AC-160 A.V.C. Superheterodyne. Condenser C17 is 0.05-mf.